Toledo is a small city located in central Spain on the banks of the Tajo river, about 70km south of Madrid. The historical centre of Toledo lies on a hilltop and is surrounded by a ring of walls. 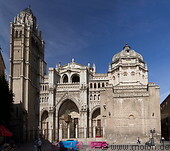 It contains many historical sites, including the Alcazar, the cathedral the Zocodover square and others. Toledo has been settled since the bronze age and was a main commercial and administrative centre in the Roman empire. It became the capital of the Visigothic kingdom and later the capital of Spain until the Moorish conquest in the 8th century. Toledo passed to the new Spanish kingdom in 1085 when it was conquered by Alfonso VI of Castile. The historic centre of Toledo consists of a maze of narrow alleys and beautiful squares and buildings. Toledo has been a UNESCO World Heritage Site since 1986.